No Magnesium Stearate and No augmentin 125 mg uses Additives..
From the Lion Rampant to Tartan, the Thistle and the flag of St. Andrew. There are many instantly recognisable Scottish symbols. The Saltire or St. Andrew’s Cross, dates from the 9th century, and is therefore, the oldest national flag still in use. The Saltire also forms part of the design of the Union Flag. The Lion Rampant, a banner showing the Royal Arms of Scotland, is frequently seen at sporting events. It is technically the property of the British Monarch and its use by anyone else is illegal, although this is almost universally ignored and never enforced. The Unicorn is also one of the heraldic Scottish Symbols. The Royal Coat of Arms of Scotland, used prior to 1603 by the Kings of Scotland, incorporated a lion rampant shield supported by two unicorns. On the Union of the Scottish and English Crowns, the Arms were quartered with those of England and Ireland and one unicorn was replaced by a lion. The Scottish Crown Jewels, are displayed in the Crown Room of Edinburgh Castle, from where they are only removed on State Occasions. A stylised version of the Crown of Scotland appears on the badges of the Royal Regiment of Scotland, the Scottish Police Forces, the Scottish Ambulance Service and Royal Mail premises, vehicles and pillar boxes in Scotland. Once the seat of power in Scotland, Edinburgh Castle is an ancient fortress which, from its position atop Castle Rock, dominates the sky-line of the city of Edinburgh. 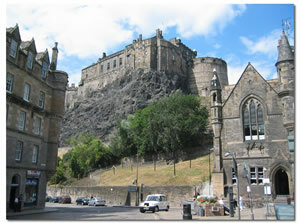 It is Scotland’s second most visited tourist attraction, after the Kelvingrove Art Gallery and Museum in Glasgow. Human habitation of the castle site dates back as far as the 9th century BC. As it stands today though, few of the castle’s structures pre-date the 16th century, with the notable exception of St Margaret’s Chapel, the oldest surviving building in Edinburgh, which dates from the early 12th century. The floral emblem of Scotland, features in many Scottish symbols and logos, and on UK currency. Heather is also considered to be a symbol of Scotland. 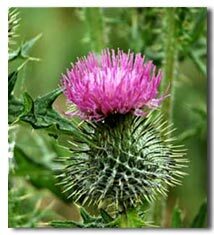 The prickly purple thistle was adopted as the Emblem of Scotland during the rein of Alexander III (1249-1286). Legend has it that an Army of King Haakon of Norway, intent on conquering the Scots landed at the Coast of Largs at night to surprise the sleeping Scottish Clansmen. In order to move more stealthily under the cover of darkness the Norsemen removed their footwear. As they drew near to the Scots it wasn’t the only thing hiding under the cover of darkness. For one of Haakon’s men unfortunately stood on one of these spiny little defenders and shrieked out in pain, alerting the Clansmen of the advancing Norsemen. Needless to say it was the Scots who won the day. Flower of Scotland is popularly held to be the National Anthem of Scotland, and is played at international events such as football or rugby matches involving the Scotland national team. However, since devolution, more serious discussion of a national anthem has led to this being disputed. Other candidates include Scots Wha Hae, Scotland the Brave and A Man’s A Man for A’ That. Traditionally known as the Scottish national dress it is a woven textile pattern with differnet colours that signify particular Scottish clans. The most common item is the kilt, which is a male garment never worn by women. The kilt differs from the skirt by its length and weight and the number of pleats or folds. Tartan is also known as Highland Dress and this description fits more correctly as the tartan was never worn by Scottish lowlanders, who comprised the majority of the Scottish population. The Highland dress which we know today, was much adapted and modernised during Victorian times. This was to fit a taste for all things Scottish promoted by Queen Victoria and her husband, Prince Albert. While the basic garment is traditional, the style and much of the other regalia, including jackets, sporran, kilt hose and garters, skean dhu, etc, and certainly the range and formality of tartans were an invention of the Victorian gentry. The 30th of November is Scotland’s national day, although Burns Night (28th January) tends to be more widely observed. In 2006, the Scottish Parliament passed the St. Andrew’s Day Bank Holiday (Scotland) Act 2007, designating the day an official bank holiday.